How do you penetrate the world's most secretive and tightly-knit terrorist organization? How do you manipulate its leaders and major supporters to unwittingly serve your goals? 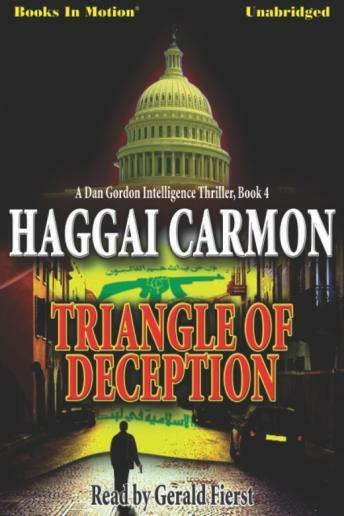 Working in a joint CIA/Mossad sting operation, Dan Gordon chose the path of deception - a triangle of deception. In this fourth installment in the Dan Gordon intelligence thriller series, Dan is on the hunt for the source of funding to terrorist group Hezbollah. He infiltrates the Lebanese network in the Paraguayan terrorist hub, Ciudad del Este, through a Lebanese expat in Sierra Leone, only to realize the operation is even more far-reaching than he has been told. A chase for false documents turns a Shakespearean drama of double identities and uncertain loyalties into a web of lies. Caught in the wrong place at the wrong time, Dan lands in a grim Romanian jail. Was it a security leak that got him in trouble? Why was he told to abandon top-secret CIA documents in a hotel room in Turkey? Was Dan made a sacrificial lamb for the CIA to make their plan look credible? Has he stumbled on a much bigger plot, one with the potential to unlock Al Qaeda's machinations in the Americas? And how will he extricate himself from his stickiest situation yet?